Mark Everard should be well known by now as the author of The Complete Book of the Roach and the charming Little Book of Little Fishes among others, and he has followed up with a monograph on the dace. As an aquatic biologist, experienced fisherman and champion of the smaller species, it is hard to think of anyone better qualified to write on the subject he has chosen. The dace is, it has to be admitted, something of a challenge, given it has always been the Cinderella species’ Cinderella species and that a dace specimen hunter is hard to imagine outside of a bad acid trip. On the other hand, you have to admit that the dace is a remarkably pretty little fish and they can be infuriatingly hard to catch when you are actually trying to hook them. 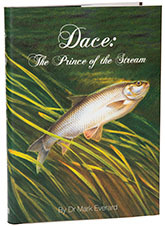 As the author points out, the most recent books on dace are William Howes’ volume from the How to Catch Them series, which was published in 1958; and Peter Wheat’s Catch More Dace, which is only slightly more up-to-date, having been published in 1975. The standard text on the subject is of course John Bailey and Roger Miller’s 1990 Chub and Dace and even that is out of print (interesting to note, it is increasingly becoming a collector’s item). So there is a space for a book on dace and Mark has obligingly filled it with this 247 page tome, which is divided into three parts: 60 pages on the ecology of dace; 132 pages on how to catch them; and a 33 page coda about dace and people. If this sounds like a lot of book for your money, I guess it is, and it is hard to imagine that anyone is likely to write a heavier tome on the subject for some time to come, if ever. As usual, the author’s words on ecology can hardly be faulted and his advice on fishing is very sensible, so in the absence of any other rival in print, this volume is where dace wisdom begins and ends as far as monographs are concerned. Mark is to be commended for his brave stand against knee jerk solutions to riparian improvement and cormorant control and my entire scientific eduction screams “listen to what this guy is trying to tell us, if you want to have any fishing left worth having” - as always, he talks an awful lot of common sense. No, the only question is whether or not the species really deserves this much space and that I can only leave you to decide, bar a few observations. The first is that this book could have done with a much tighter edit and it is tediously repetitious in places; the second is that the entire section on dace and people could have been binned without serious loss; and the third is that the readability has not been improved by the addition of extra spacing before every single paragraph. The overwhelming impression is that the manuscript was thought to be a bit light and that every attempt was made to stretch it to some kind of imaginary finishing line, when in fact the core is solid enough and could have stood up on its own. If you are into dace, you need it.